An illustrated lecture delivered by Professor Jodi Magness. In 1946-7, the first Dead Sea Scrolls were discovered by accident near the site of Qumran. Eventually, the remains of approximately 1000 scrolls were found in 11 caves surrounding Qumran. 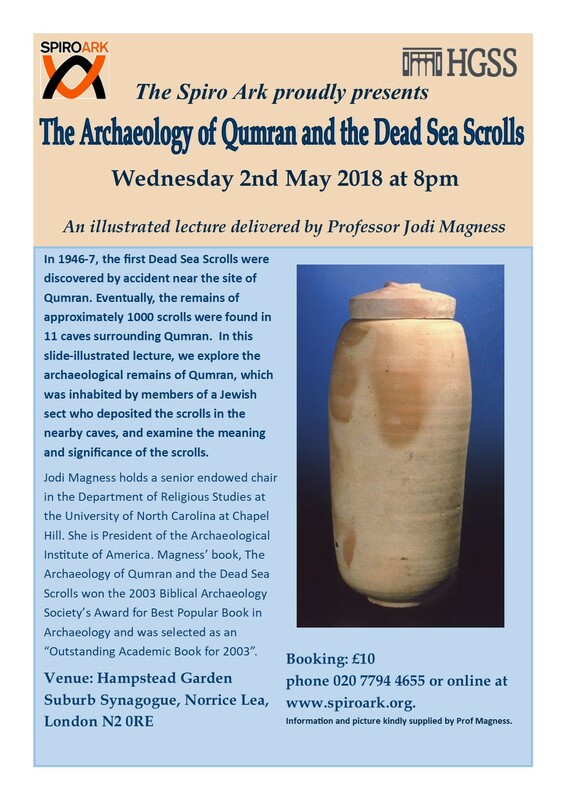 In this slide-illustrated lecture, we explore the archaeological remains of Qumran, which was inhabited by members of a Jewish sect who deposited the scrolls in the nearby caves, and examine the meaning and significance of the scrolls. Jodi Magness (born September 19, 1956) is the Kenan Distinguished Professor for Teaching Excellence in Early Judaism at the University of North Carolina at Chapel Hill. She previously taught at Tufts University. She received her B.A. in Archaeology and History from the Hebrew University of Jerusalem (1977), and her Ph.D. in Classical Archaeology from the University of Pennsylvania (1989). From 1990-92, Professor Magness was Mellon Post-Doctoral Fellow in Syro-Palestinian Archaeology at the Center for Old World Archaeology and Art at Brown University. Recently, Magness has had multiple guest appearances on the National Geographic Channel's television series The Story of God with Morgan Freeman - a documentary series exploring religious beliefs across cultures around the world. Magness has participated in 20 different excavations in Israel and Greece. She co-directed the 1995 excavations of the Roman siege works at Masada. From 1997-99 she co-directed excavations at Khirbet Yattir in Israel. Since 2003 Professor Magness has been the co-director of the excavations in the late Roman fort at Yotvata, Israel. In 2011 she began to dig at Huqoq. Magness is an extremely popular professor whose "unique teaching style of using vivid anecdotes [keeps] students on the edge of their seats." At the time of The Lost Tomb of Jesus controversy, Magness was widely quoted noting "that at the time of Jesus, wealthy families buried their dead in tombs cut by hand from solid rock, putting the bones in niches in the walls and then, later, transferring them to ossuaries." Whereas "Jesus came from a poor family that, like most Jews of the time, probably buried their dead in ordinary graves. "If Jesus' family had been wealthy enough to afford a rock-cut tomb, it would have been in Nazareth, not Jerusalem," she said. Magness also said "the names on the Talpiyot ossuaries "indicate that the tomb belonged to a family from Judea, the area around Jerusalem, where people were known by their first name and father's name. As Galileans, Jesus and his family members would have used their first name and hometown."